Portugal | A balanced diet . . .
As Director for Program Planning and Communications (DPPC, from 2001 until my retirement in 2010) at the International Rice Research Institute (IRRI), I managed the institute’s portfolio of research projects, reporting back to donor agencies on progress and outcomes, such as the UK’s DFID, USAID in the USA, or the SDC in Switzerland, to mention just three. And working with them to ensure continued financial support to the institute each year. On a rolling basis, I tried to meet officials from these agencies on their home turf, so to speak, and would coordinate several meetings in a single trip. I often scheduled meetings with European donor agencies when I was back on leave in the UK each year. And this was the case in early July 2003 when I visited Portugal (Lisbon) and Spain (Madrid). 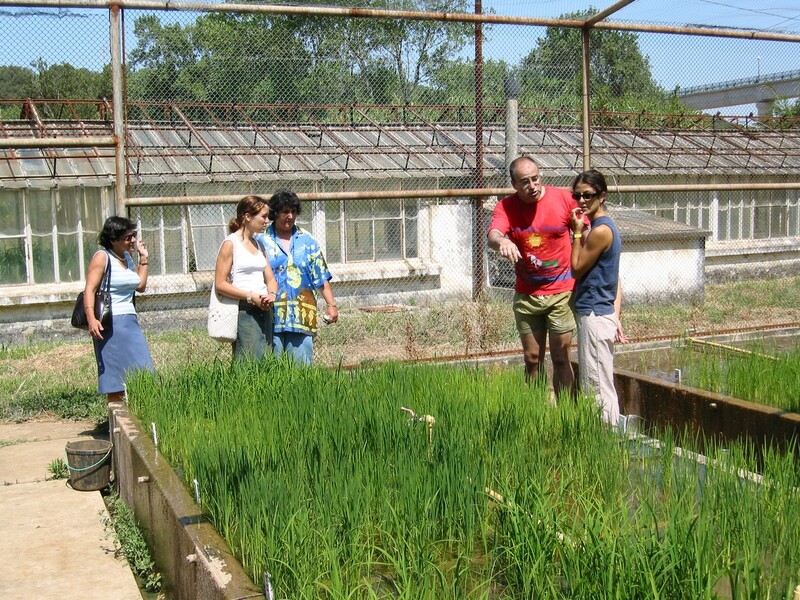 At that time, one of my IRRI colleagues, Dr Swapan Datta, had a joint research project with Professor M. Margarida Oliveira of the Instituto de Tecnologia Química e Biológica António Xavier (ITQB), a scientific research and advanced training institute of the Universidade NOVA de Lisboa in Portugal. One of her students, Marta Vasconcelos, worked on rice biofortification with ferritin in Datta’s lab. Another, Sónia Negrão, worked with IRRI’s plant breeders for part of her PhD study, and held a post-doctoral fellowship at IRRI as well. On the beach at Oeiras close to ITQB, with Margarida, Marta, and Sonia (in the left image) and Sonia and Marta (right). Prof. Oliveira and I visited the Portuguese overseas aid agency to seek funding for joint rice projects. Portugal, at that time, provided only a small amount of funding (if any—I don’t remember the details) to IRRI. I also got to see some rice growing at the ITQB experiment station. During the visit to ITQB, I gave a seminar about the genetic resources of rice and, with the donor visit, most of my second day in Lisbon was quite full. But, as was often the case in visits to donor capitals, there also was an opportunity for some sight-seeing. I had arrived to Lisbon the day before, in the early afternoon. After settling into the Hotel Lutécia in the Areeiro district (map), north of the city center, I decided to see what Lisbon had to offer and took the metro to the city center, about a 20 minute ride from the Roma-Areeiro station to the Baixa-Chiado station. Lisbon is a lovely maze of narrow streets, and large open plazas. One thing that immediately struck me, especially from the heights of the Castelo de S. Jorge, were the orange tile roofs of all the houses spread over the surrounding hills, and the views over the Tagus River, and west to the expanses of the Atlantic Ocean. Anyway, I made my way from the metro, south along Rua Agustina (mostly traffic free) full of designer shops and cafes and restaurants towards the Praça de Comércio. And although I’d intended to carry on walking around the city, I did something I’d never done before. Seeing a line of double-decker open top buses to one side of the plaza, I decided to take a city tour. Having only a short time in Lisbon I realized this would be the best way of seeing much of the city. The tour lasted about two hours, and I certainly saw many of the important sites, some of which I went back to explore on foot afterwards. The tour took in: Praça da Figueira; Praça D. Pedro IV; Praça da Restauradores; Av. da Liberdade; Praça do Marquês de Pombal; the view down to the coast from the Alameda Cardeal Cerejeira; west to the Torre de Belém; and back to the city center via the Praça do Império and the magnificent Mosteiro dos Jerónimos, passing under the impressive Ponte 25 de Abril over the Tagus. Although it was getting on in the afternoon, I decided to walk up to the Castelo de S. Jorge and enjoy the views over the city. Castelo de S. Jorge from Praça da Figueira (L) and the plaza from the castle (R). Then, it was back down to enjoy a beer or three and a dish of bacalhau (a typical dish of cod), before heading back to my hotel. On the second evening I decided to stay near my hotel, write up my notes, and get ready for a mid-morning departure to Madrid the following day. I had just a couple of nights in Madrid. I’d been through the city’s airport in 1981 on my way to the Canary Islands. That was in June, and I remember stepping outside the airport terminal building to experience the heat. It was over 40ºC. Now, I’d lived in the tropics for over eight years up till then, but I’d never experienced heat like that. In July 2003 it was pretty hot as well. I arrived mid-afternoon on my flight from Lisbon. I was booked into a boutique hotel near Real Madrid’s Santiago Bernabéu Stadium. By the time I was settled into my hotel, it was late afternoon, and fortunatley it was cooling down. So I took the metro to the Puerta del Sol plaza. I wandered along the Calle Mayor, taking in the Plaza Mayor and Plaza de la Villa on my left, on on towards the Catedral de Santa María la Real de la Almudena and the Palacio Real. Nearby there was a cafe where I could sit outside and enjoy a cold beer, before I headed back towards the Puerta del Sol plaza to choose a restaurant for my evening meal. Then it was back on the metro to my hotel. I had meetings the next day, all day at the Instituto Nacional de Investigación y Tecnología Agraria y Alimentaria (INIA) in the Moncloa-Aravaca district, northwest of the city center. In the evening I chose a small restaurant close to the hotel. Excellent food! Then, early the next day, it was off to the Madrid-Barajas Adolfo Suárez Airport, and an Iberia flight to Switzerland (Zurich), where I had a meeting in Bern at the SDC. 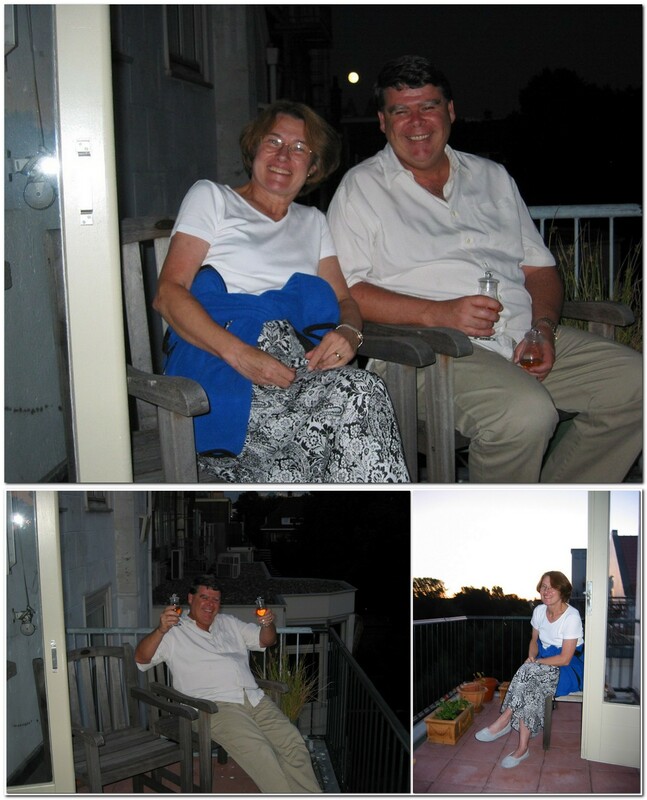 Before heading back to BHX, I visited old friends in The Hague, Gordon and Joan MacNeil. Gordon had been IRRI’s Deputy Director General for Finance, and left the institute in 2002. All in all, an enjoyable trip, but not very fruitful donor-wise, unfortunately. In 2012, Steph and I had a short holiday in Portugal, visiting my eldest brother Martin and his wife Pauline who live about 100 km north of Lisbon. Not just castles in the air . . .
My wife Steph and I have just returned from a short holiday in central Portugal, staying with my eldest brother Martin and his wife in their beautiful home in central Portugal. 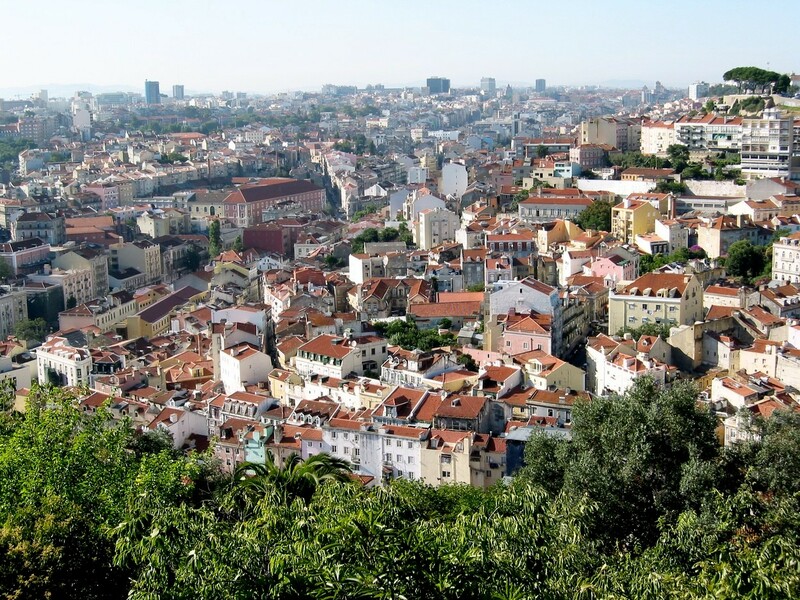 I had visited Portugal only once before – in July 2003 – and then just to Lisbon. 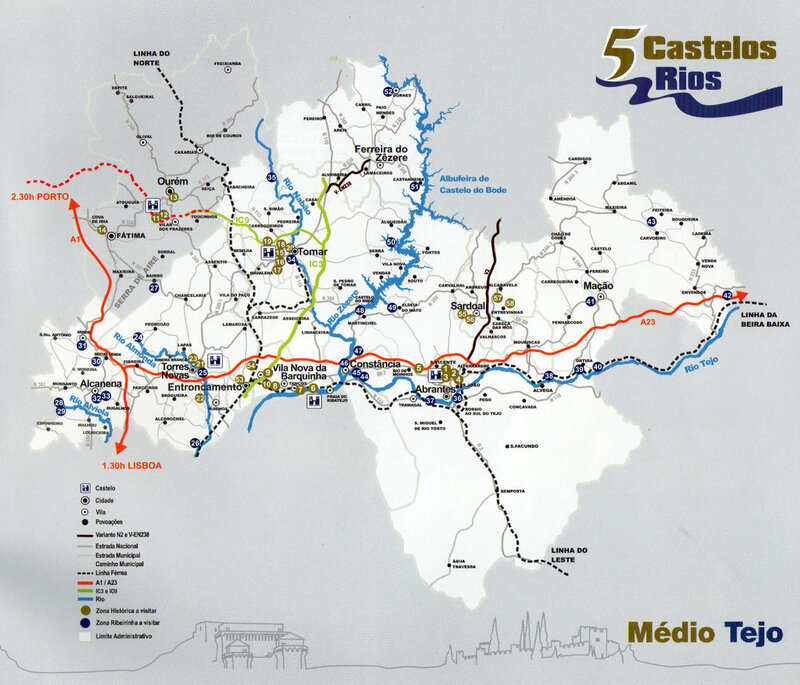 So Steph and I were looking forward to exploring the Ribatejo, and specifically the geographical sub-region of the Medio Tejo. And it did not disappoint! Just click on the photos below to open a larger image or link to web albums of the places we visited. Five rivers and five Templar castles define the Medio Tejo, and we saw some of them, across a landscape of rolling hills that are not very high at all. Everywhere is covered in pine trees and cork oaks – as well as commercial eucalyptus plantings – and, unfortunately, subject to periodic wildfires during the hot summer months. In fact, there had been a spate of fires just a week or so before we travelled to Portugal, and we saw many areas close to Tomar that had been burnt through. The fires even crept up to the boundary wall and fence of my brother’s house, and singed a couple of trees in the garden. Fortunately there was no other damage – just a lot of soot and ash to cope with for several weeks. Others close by were not so lucky. Tomar is about 140 km northeast of Lisbon, connected by an excellent network of motorways, mostly empty except closer to Lisbon. Dominating the Tomar skyline is the Convento de Cristo and castle, built by the Templar knights in the 12th century. In fact, Tomar was founded by D. Gualdim Pais after evicting the Moors – a sequence of events that is encountered at most if not all of the Templar castles that are found in several towns in the Medio Tejo. Tomar was the headquarters of the Order of the Knights Templar. The Templar castles are mostly in a very good state of repair. It seems that they were not ravaged by internal conflicts such as those that affected most of the castles in England and Wales, for example. While a walk along the castles walls – with amazing views over the old town of Tomar – is possible, the keep and other castle buildings are closed to visitors. But adjacent to, and surrounded on three sides by the castle walls, is the Convento de Cristo (a monastery) itself, a magnificent series of buildings, arches and cloisters. Among the most inspiring of the decorative stonework is the Claustro de Santa Bárbara window on the west wall of the monastery church. From the various roof terraces are impressive views into the different cloisters, and of course the ubiquitous arched passageways. Particularly impressive are a couple of seemingly ‘floating’ stone spiral staircases leading to one of the roof terraces. Looking over towards the old town of Tomar, the monks’ gardens are adjacent to the monastery itself, and beyond the castle walls to the west is the Mata Nacional de Sete Montes, once upon a time the hunting grounds of the Templar knights, but now a 37 ha garden and forested area freely accessible to the public. At the gates to the garden there is an impressive statue of Henry the Navigator (the Infante Henrique), once the governor of the Order of Christ (Portuguese successor to the Order of the Knights Templar in the 15th century), and considered to be the patron of the age of Portuguese exploration. Water was supplied to the monastery and castle over the Aqueduto de Pegões, constructed in the early 16th century, and comprising – at its highest point – 180 double arches, and stretching more than 7 km into the countryside to the northwest of Tomar. Below the castle, the old town of Tomar nestles lazily against the hill on which the castle and monastery were built. From the Rio Nabão (that separates the old town from the new) a network of cobbled streets meets in the main square, the Praça da Republica, with its town hall, Igreja de São João Baptista and, facing the main entrance of the church in the center of the square, a statue of Gualdim Pais. An old bridge – named after King Manuel I – crosses the Nabão, linking the old and new towns. On a small island in the river is the Parque de Mouchão, with a large traditional water wheel at the entrance across a small bridge. The wheel has traditional pots on its rotating rim to capture the water. New Tomar is much larger than the old town, and a weekly market is held along the banks of the river, where all manner of goods are sold: fruits, vegetables and flowers; meat; live animals, including rabbits, songbirds, ducks, chickens, geese, and even peacocks; tools and gardening implements; household pots and pans, and impressive copper stills; and a wide range of clothes and shoes. We had the opportunity of visiting two more Templar castles: at Ourém, some 27 km to the northwest of Tomar; and at Almourol on an island in the middle of the Rio Tejo, near Vila Nova de Barquinha, about 23 km due south of Tomar. The castle at Ourém was constructed on the top of a hill, and is approached up a very steep road; at the top there is a wonderful 360° panorama, for at least 50 km on the day of our visit. A village of white rendered houses and narrow winding streets clings to the hillside below the castle, with a small main square and church. By coincidence it was the twelfth anniversary when a local baker had been severely burned in an accident, and not expected to survive. He apparently had a ‘vision’ of the 14th century general and Carmelite friar Nuno Álvares Pereira, and his subsequent ‘miraculous’ recovery was enough for Pope Benedict XVI to canonize the friar in April 2009. Just a few kilometers across the valley to the southwest lies the village of Fátima, site of the ‘apparition’ in 1917 to three local children by the Virgin Mary. 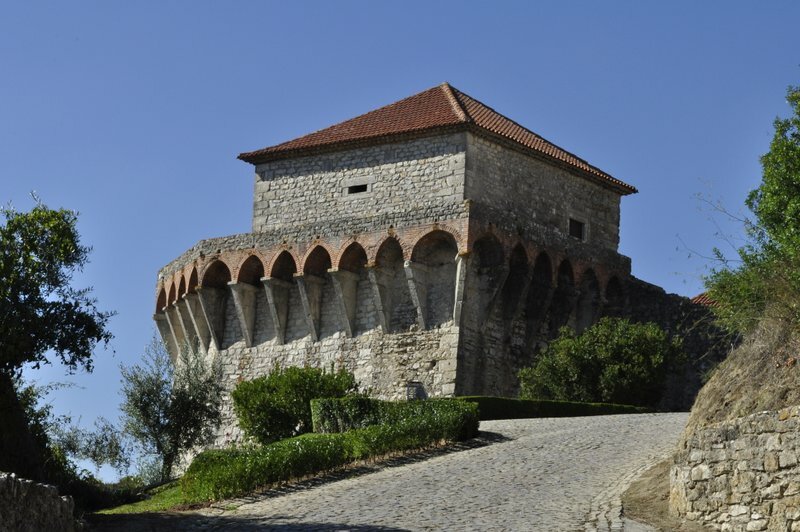 One of the interesting features of the twin towers of Ourém castle are the red tiles incorporated into the stonework. On another day we visited the castle at Almourol. If you asked a young child to draw a castle, then this one would be just as you might imagine. Built on a small island in the middle of the Tejo, there are impressive castellated walls and tower, silhouetted against the skyline. Under normal circumstances, access to the island and castle is only possible by a small boat, but on the day we visited the river level was so low that it would have been possible to hop across the rocks on to the island. This is not, however, permitted! After all, the boatman has the concession and has to make a livelihood. Apart from these excursions, we enjoyed wonderful hospitality. Even on the less sunny days we enjoyed a dip in their pool, and a glass or three of excellent (and exceptionally cheap – by UK standards at least) of vinho tinto or vinho verde. All too soon our 10-day holiday was over, and we were on the easyJet flight back to London-Luton from Lisbon. Needless to say, the weather on arrival at Luton – wet, windy and cool – was a bit of a shock to the system, and a world away from that we had enjoyed in Tomar. So while most tourists tend to head to the Algarve and points south, the Ribatejo region is well worth a visit and, I guess, is less busy for much of the year, except every four years when Tomar celebrates its Festa dos Tabuleiros (the next one is in 2015).